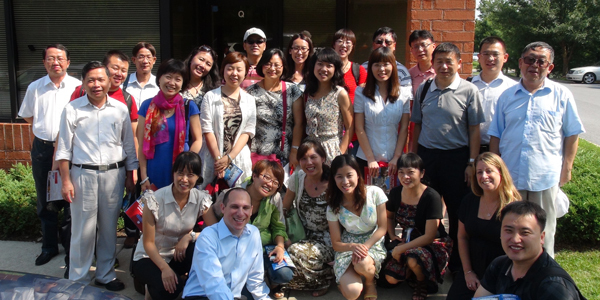 On August 9, 2012, United Work and Travel, a division of American Pool Enterprises, Inc. welcomed 25 university officials from accredited universities throughout The People’s Republic of China. This delegation was hosted by Each Future Cultural Network (EFCN), an official overseas recruiting partner of United Work and Travel. They arrived by bus and received a brief seminar about the J-1 Summer Work/Travel Program and the new rules and regulations that went into effect this Summer. Additionally, this delegation of university officials received a tour of the United Work and Travel Headquarters before departing for their next destination. From Owings Mills, the EFCN Group then traveled to the United Work and Travel office in Ocean City, MD for host company employer tours of Jolly Roger Amusement Park and other various host company employers in Ocean City, MD. From Ocean City the group then toured Washington, DC and New York City. The purpose of hosting the EFCN delegation of officials in the USA is to provide a greater understanding of the J-1 Summer Work/Travel Program that will allow these individuals to be able to deliver clear and transparent program information during their future program recruitment in The People’s Republic of China. United Work and Travel, a division of American Pool Enterprises, Inc. has been designated by the United States Department of State to sponsor full-time university students from outside of the USA on the J-1 Summer Work/Travel Program since June of 2003. United Work and Travel is the foreign recruitment division of American Pool Enterprises, Inc.
We offer cultural exchange programs to foreign university students from around the world and specializes in full service programs targeted to meet the expectations of our participants and the needs of our host company employers. Our programs includes 24-hour assistance for our students and host company employers from the time that the initial application is submitted until our student participants return to their home country. Additionally, UWT also provides assistance with Social Security, student housing, health insurance claims and much more!